Hot off the press and fresh for the press! 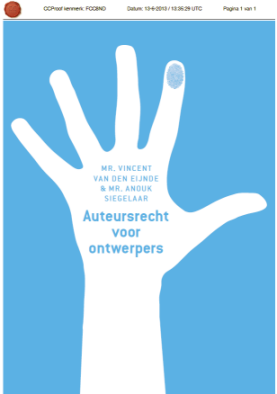 Authors: Vincent van den Eijnde LL.M. (director Pictoright®) and Anouk Siegelaar LL.M. (jurist with the Association of Dutch Designers (BNO®). “It seems so simple: every designer owns the copyright of the work he or she has designed. Obviously it is much more complicated than that. For example, how does it work when a designer works together with a photographer? And what if a designer creates something without signing it? Or if he or she is on salary?”. These are all questions I encounter daily. This book is recommended by Rob Huisman to all designers and design students. Luckily, the book gives attention to the registration of designs. Thus, the cover design of the book is registered at CC Proof® and provided with a digital date. An image of this registration can be found on page 19. This serves as an example of how to register your designs safe and affordable. There are 5 pages devoted to trade mark law. The chapter about ‘Nijn Eleven’ in chapter 9 is my favourite chapter of this book. This chapter is about ‘Restrictions on copyright’. In principle, The Copyright Act allows protected work to be used without permission, when it’s in the context of a parody or caricature. 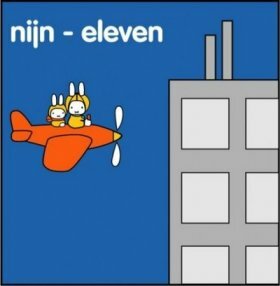 A good example is ‘Nijn-eleven’ with a famous verdict of the Amsterdam Court. The judge allowed the parodies on the internet, because the intent was humorous, the absence of competition intentions and lack of confusion. The parodies were, according to the judge, ‘valid’ parodies. 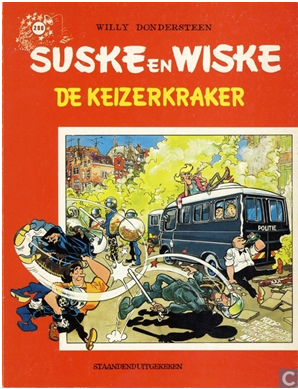 Spike & Suzy (Suske & Wiske in Dutch) came into the Amsterdam squatters world without the permission of the author Willy van der Steen. I bought this book with the knowledge that the final words have not yet been spoken. It is a nice book. For the enthusiasts the book is available at Herengracht 227. The dispute about the parody reached the Supreme Court. Eventually, the Supreme Court decided that the similarities went a step too far. Among copyright specialists (including yours truly) there was a lot of criticism, because the decision was too restrictive in the context of the possibility to create a parody. If cartoon characters may not be used in a similar way to the real characters, the effect of the parody would already be lost in advance. In short, a book for everyone who comes into contact with copyright (and who doesn’t).